Add all dry ingredients except chocolate. Combine well. Scrape dough onto plastic wrap and flatten into a 6 inch round disc. Chill. Place on parchment or silpat lined baking sheet and bake about 20-25 minutes until golden brown. Hi Michelle! 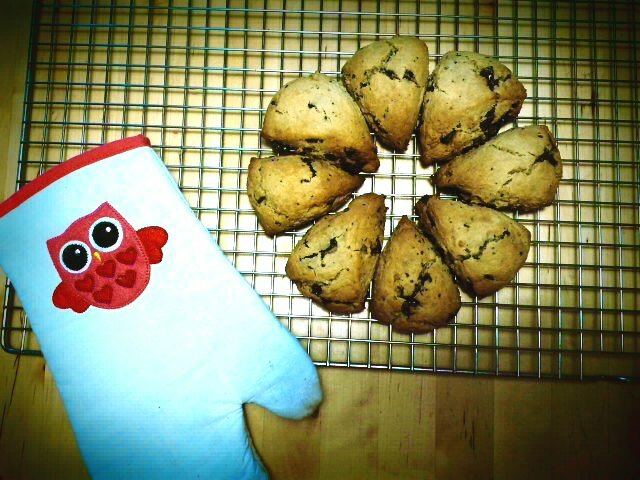 I made the chocolate chunk scones today and they have came out perfectly done just like your picture and they taste amazing!! just like a scone should be, nice crunch on the outside and moist inside. It has been a blessing every since I found your website after trying to look for a gluten free chocolate chip cookie recipe that at least taste right , i found you. I have been gluten free for about 4months now, and at first was stressful searching for gf recipes that didn’t taste so awful n bland.. Your recipes are soo delicious every time i make them. My family who are not gf request I make only your desserts n dishes. You truly are heaven sent! to share such wonderful recipes to all out there in gf world. Thank you. God bless you. Hi Michelle! I made these today and they have came out perfectly done just like your picture and they taste amazing!! just like a scone should be. It has been a blessing every since I found your website after trying to look for a gluten free chocolate chip cookie recipe that at least taste right , i found you. I have been gluten free for about 4months now, and at first was stressful searching for gf recipes that didn’t taste so awful n bland.. Your recipes are soo delicious every time i make them. My family who are not gf request I make only your desserts n dishes. You truly are heaven sent! to share such wonderful recipes to all out there in gf world. Thank you. God bless you.